This March saw the return of Marie Curie’s Annual Great Daffodil Campaign, a high profile fundraising initiative designed to increase awareness and donations to the charity. The Great Daffodil Appeal offers people the chance to give a small donation to wear a Daffodil pin, in order to support Marie Curie in providing care and support for people living with terminal illness and their families. YouGov CharityIndex data indicates how effective this year’s campaign has been. Marie Curie’s Ad Awareness score (whether someone has seen the charity’s advert in the last fortnight) rose by 6% over a two week period. Crucially, it appears as though Marie Curie’s campaign has achieved a good level of cut through with its key audience. 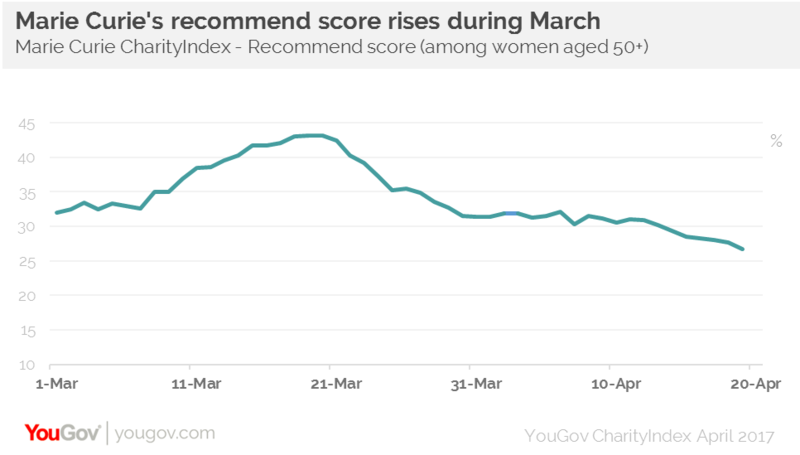 YouGov Profiles data indicates that the average donators to Marie Curie are women aged 50+, and it is clear the campaign has particularly resonated with this demographic as its Ad Awareness rose by 13% during the same two week period. Whilst Marie Curie has several fundraising campaigns, The Great Daffodil appeal has cemented its status as one of the most recognised. While achieving a good level of Ad Awareness is key, the charity would naturally want to see donations as a result. Our data shows that the signs are good on this front, as its Donation Consideration (which shows which charities people are likely to consider giving to when they are next looking to donate) increased by 7% in mid-March, and it’s Recommendations (people who would speak about the brand positively) grew from 32% to 43%. The good news for Marie Curie is that this year has seen The Great Daffodil campaign perform better than previous years, especially amongst women aged 50+. It outstrips the score from 2015 by 2 points and by 3 points in 2016. Marie Curie can be content that it has managed to achieve cut through with its recent marketing efforts. The focus now will be on harnessing this momentum in the remainder of the year, and working towards ensuring that their other campaigns receive as much positive attention. To learn more about CharityIndex, click here.